A person or organization planning to host an event would surely need vendors to provide goods and services and to make the event successful. In such scenarios, a vendor event form is used where the concerned party collects all the information from various vendors. After analyzing these forms, the party can zero in on the vendor who seems to suit their requirements as well as their budget. You may also useful Adverse Event Forms. This form is used by a party planning an event to invite vendors to submit the details about their services. This in turn helps the party to take an informed decision. Used by a person or a company planning an event to get details from various vendors about what they have to offer, the form gives them an idea of which vendor to approach for the event. 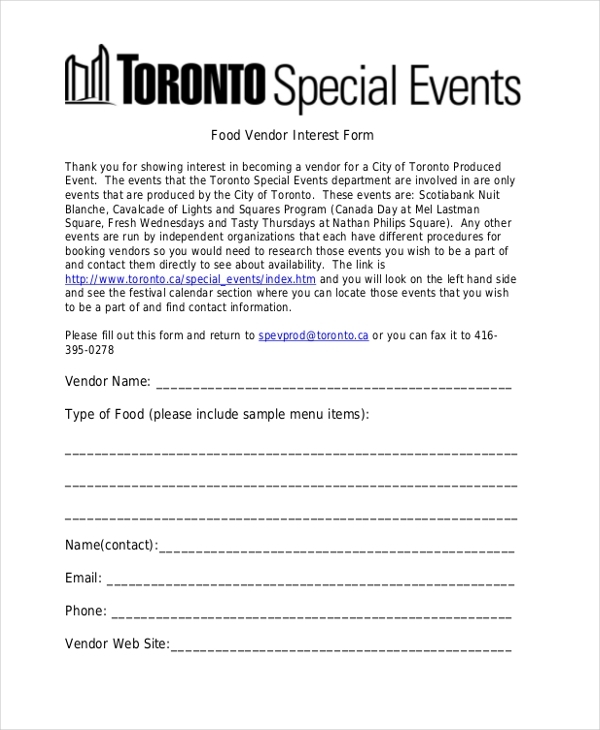 This form is used by an event organizer to invite registration from food vendors for the event. The vendors are required to share the details of their services in the form which helps the party to zero in on the perfect vendor. 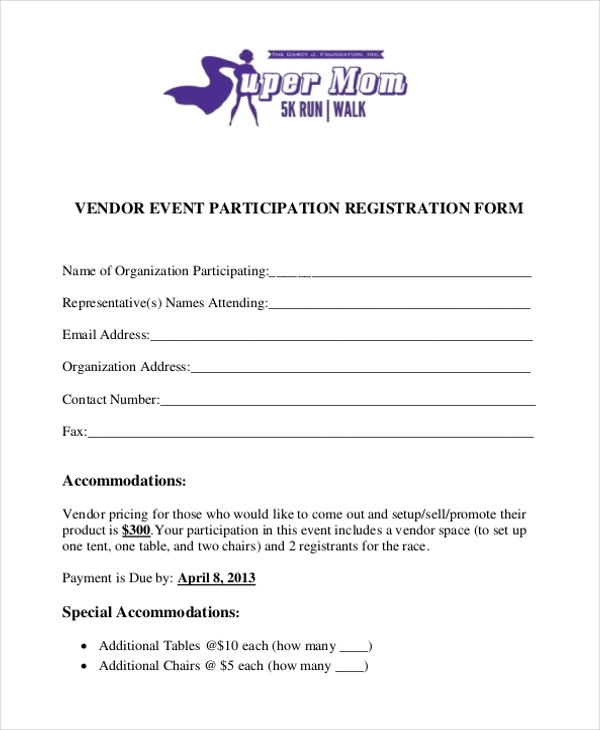 As the name indicated, this form is used by an event organizer to invite vendors to register for the upcoming event. The form comprises of certain terms that the vendors should adhere to. This form is mainly used by an event management team to record the details of an event and the vendors assigned for it. This helps the team to avoid any last minute hitches and mix ups. 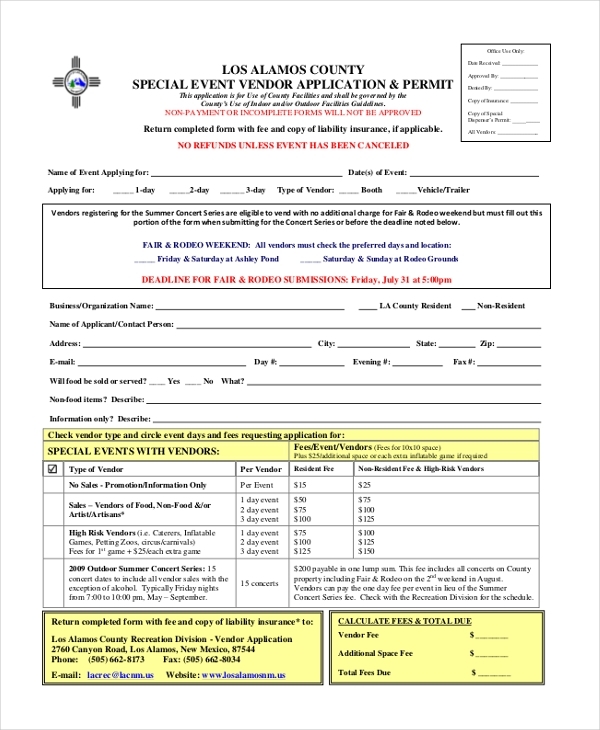 Any company involved in organizing a special event may use this form to invite vendors to show their interest in providing their services to the event. 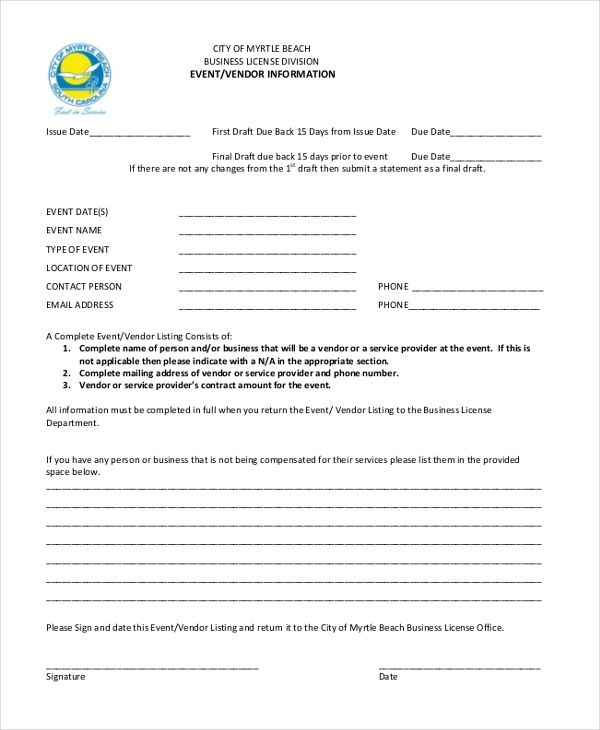 The vendors may have to fill in the details of their services in this form. 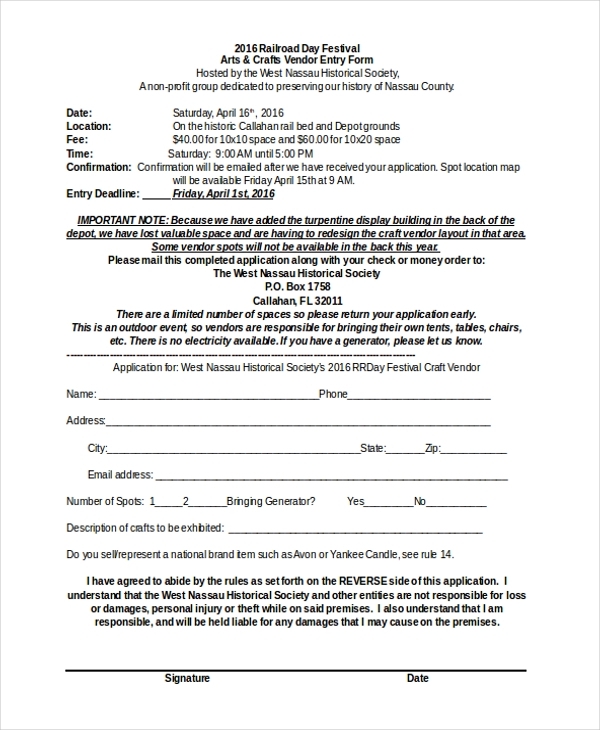 A person or company that may be organizing an arts and crafts event may use this form to invite proposals from various vendors. The vendors are required to share their details in this form. 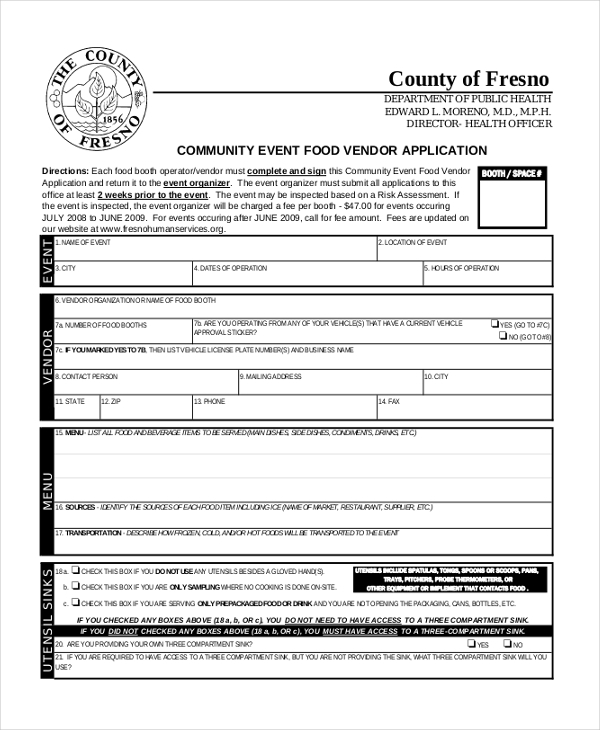 This form is used to attain applications from vendors who may be interested in providing food and catering services in a community event. They are needed to share the information about their food and menu. This application form is used by an event management company or any other organization planning a special event, to extract relevant information from vendors that will help them decide the right vendor for the event. 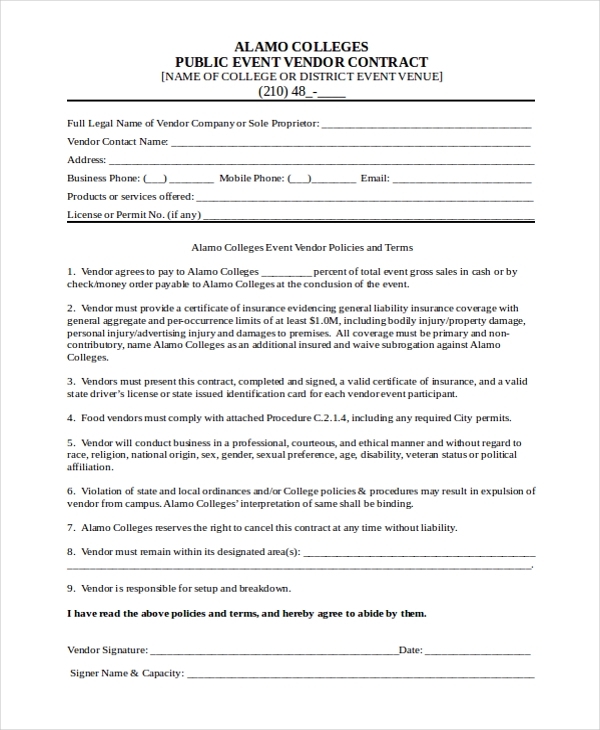 This is a contract form that is used by an organization to get into an agreement with a vendor, who may have agreed to offer his services for a public event organized by the company. Who Should Use a Vendor Event Form? A vendor event form is used to gain applications from various vendors with relevant details, which helps a person or an organization to finalize the best vendor for their events. Thus, this form can be used by any person or organization in the process of planning an event. Event management companies to invite vendors to add to their rosters. Person/Organization who may be planning an event. Useful Event Management Forms. 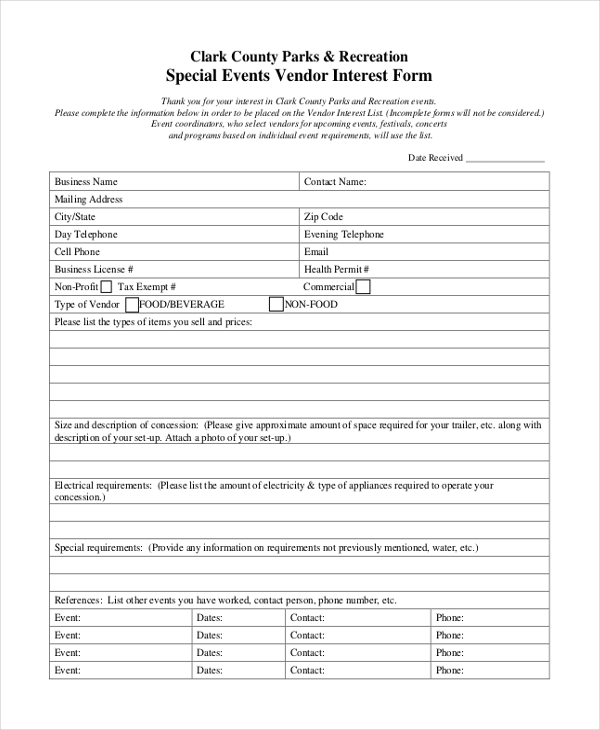 Why should one Use a Vendor Event Form? Organizing an event is not mean task and finding the best vendors can be quite a challenge. By using a vendor event form, the party concerned can get relevant information from the vendor like their details, services offered, their specialties etc. Since these forms help the party to arrange these in a structured and organized manner, it becomes easier for them to analyze all the vendors and find the one who would be perfect for their event. You can also see Event Proposal Forms. What are the Benefits of Using a Vendor Event Form? 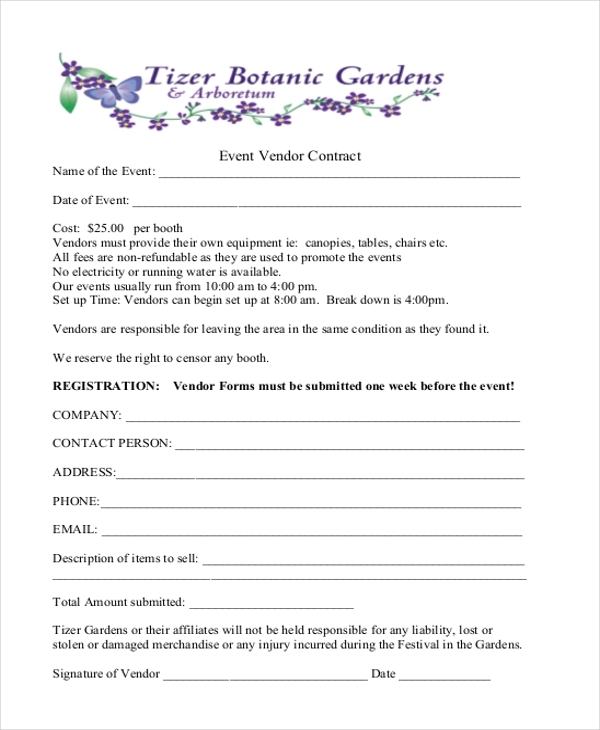 A vendor event form will surely make life easier for you, especially if you are looking to hire vendors for an upcoming event. However, if you are not sure how to design these forms, you can find these online. Browse from the wide range of these forms online and find the one that is most relevant to you. 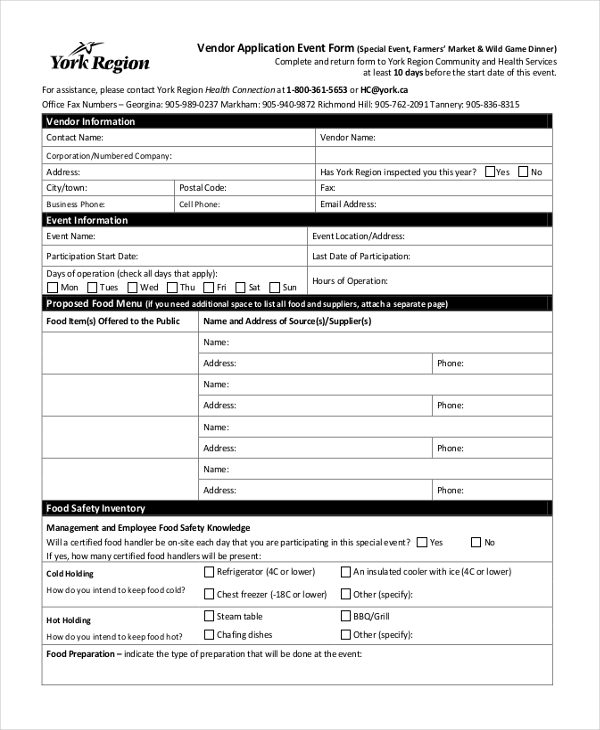 You can easily download this form and then customize it to suit your requirements.